Love to spend time in your sunny Columbus OH back yard? Want shade? If you are like me, you are trying to figure out ways to get more sun, not less. But, trust me, there will soon come a time when you will be looking for ways to get a little protection from the hot summer sunshine. 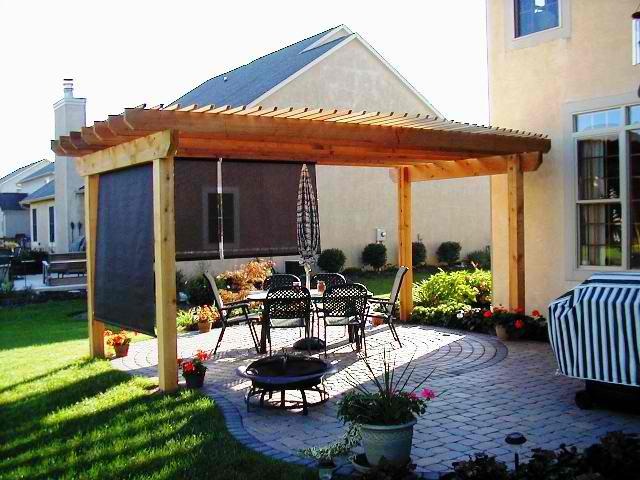 One of the most beautiful and versatile ways to introduce additional shade to your deck, patio or yard is by building a Columbus pergola. Pergolas are open structures that can transform your yard or garden into a cooler, quieter, more peaceful haven. They frequently have a lattice design across the “roof” which provides shade on its own and may also serve as a frame for decorative climbers like clematis or wisteria. Whether or not your pergola is adorned with greenery, it provides a striking vertical interest to your yard. Pergolas can be free-standing and may be designed in many different shapes with details that complement the architecture of your home and yard. One of the first things we look at when starting a discussion about a pergola or Columbus arbor or trellis is the orientation of the yard with regards to the sun. It’s important to orient the structure so that it best suits your needs during the prime outdoor entertaining months. We’ll also help you choose the size of your pergola based on how you plan to use it– I love them for their flexibility is size, design, and choice of material. Many of our customers love vinyl pergolas because they are low maintenance and their slats are angled slightly to provide additional shade. White is the most popular color for our vinyl structures as many homes have white trim on their windows or elsewhere on their exterior, which provides a nice visual tie-in. Beige is another option. Regardless of color, vinyl offers superior strength and long life, in addition to its easy-care nature. 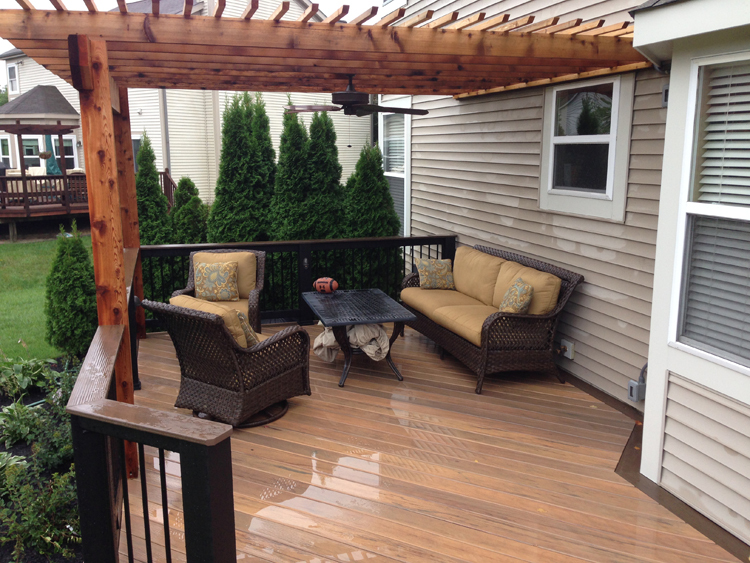 Pressure-treated pine is the least expensive option for building a pergola, with cedar at the midrange (about 20% more) and vinyl at the higher end (about a 75% premium, depending on the design). Fiberglass and aluminum have a smaller presence in the marketplace. 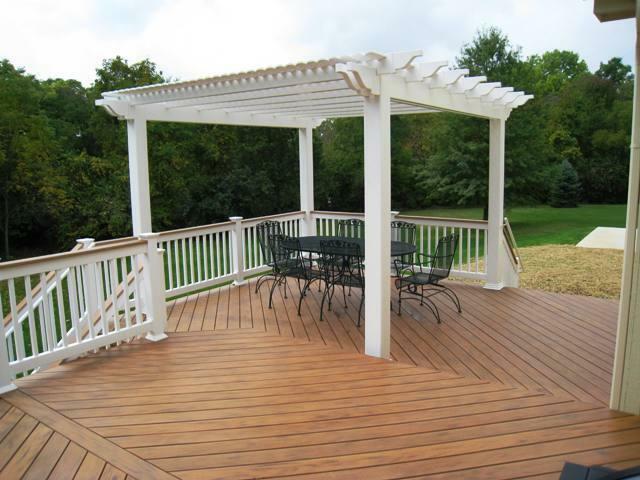 Regardless of the material you choose for your Columbus pergola, it will be a gorgeous adornment to a walkway, deck, patio or other seating area. If you are interested in a new twist on the traditional pergola design, I’d encourage you to check out ShadeTree canopies. They have an almost Mediterranean look, which will make you feel like you have an exotic getaway locale right in your own backyard. Whether you choose ShadeTree or another pergola design, you have the option of upgrading with ceiling fans, lights, speakers or other accessories that will make your yard more fun and festive. Bring us your ideas or ask us for some. Brainstorming your dream backyard is the most fun part of every free consultation.